1. How to mount the SnapVault secondary volume as a read-only NFS datastore and browse the .snapshot folder. 2. How to FlexClone a SnapVault secondary volume/snapshot and mount as writeable. 3. How to perform a SnapVault Restore from SnapVault secondary to a Qtree on the primary. If you have remote connectivity from hosts in the primary site to the DR (SnapVault secondary) site, this method is very simple. 1.1 (Recommend) First suspend the SV-SMVI backup job schedule. 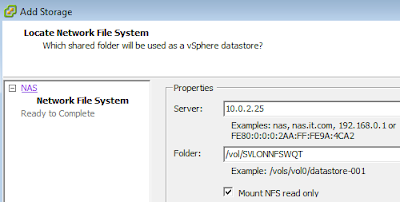 1.3 Mount the volume as a read only NFS datastore. 1.4 Browse the datastore and .snapshot folder for backups, and copy the data (VMDKs etcetera) as required. 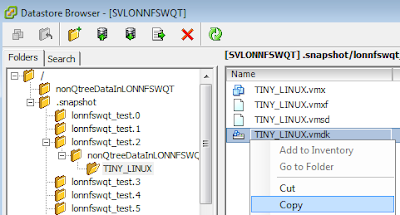 1.6 Resume the SV-SMVI VSC backup job schedule. Note i: You cannot mount a VMDK from a read-only NFS datastore to a live VM. 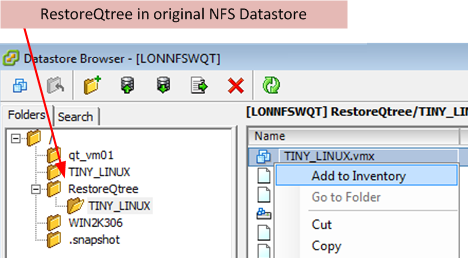 Note ii: You could mount the datastore without the “Mount NFS read only” tick, but it is still a read only file system so the above applies. Note iii: Requires NFS license on the secondary filer. Note: When running the vol clone command, the error message below will appear - don’t worry as the error is for the new volume not the SnapVaulted one! SEC:wafl.qtree.qsmBreak.base:error - Breaking snapmirrored qtree 1 in volume SVSECVOL_FCLONE: base snapshot no longer exists. Use snapmirror resync or initialize to re-establish the snapmirror. Creation of clone volume 'SVSECVOL_FCLONE' has completed. 3.1 Suspend the SV-SMVI VSC backup job schedule. Note: When the snapvault restore from the secondary to the primary is complete, state will be Broken-off. Note ii: Here I restored back into a new restore Qtree in the snapvault primary volume, the restore could also be done to a qtree in another volume.